The Odyssey2 Timeline! - The Odyssey² Homepage! A Blast From the Past! What follows is a chronicle of significant (and not-so-significant) events in Odyssey² and Videopac history. Each event in this list has been carefully researched. When available, sources are provided for each entry. Please note: while most major events (e.g. : the Pick Axe Pete Pick-Off finals) can be traced to the exact day of occurrence, some events (such as game releases) are difficult to pin down to specific days, or even specific months in some cases. All dates are presented as accurately as possible. Magnavox President Alfred di Scipio claims that his company will have a microprocessor-based video game on the market in 1977, probably by the Christmas season. Source: "The TV Makers' Game Plans." Business Week: Jan. 17, 1977. Page 34N. John Helms, the videogame engineering group leader at Magnavox in Fort Wayne, visits Sanders Associates. Among other things, Helms is there to secure Sanders's and Ralph Baer's assistance with the Intel microprocessor TV game -- the project that would later become the Odyssey². Ralph Baer writes a letter to John Helms to follow up on his visit. Baer suggests some collaborative actions and provides cost estimates. Ralph Baer has a telephone conversation with John Helms, the videogame engineering group leader at Magnavox's Fort Wayne center. Fauth states that there is serious talk of cancelling the Odyssey² project, maybe that very day. Helms suggests that Baer come to the Tennessee TV set and videogame manufacturing plant to attend an important meeting. Ralph Baer flies to Tennessee to attend the Magnavox meeting, which begins at 10 a.m. The subject: "Discontinuance of Odyssey² development by Magnavox management." Baer argues that Odyssey² has a real chance for success and urges John Fauth, a Senior VP at Magnavox, to continue the project. That afternoon, John Helms and Baer travel to Fort Wayne, IN, to visit Odyssey² engineering headquarters. The mood is bleak; black crepe paper is hung on the walls and many engineers are on the phone trying to line up new jobs. Helms expresses "cautious optimism" about the future of Odyssey² and shows Baer a fully functional development unit. Baer finds the system unique and especially appreciates its keyboard. Ralph Baer spends the day at engineering HQ in Fort Wayne, where Helms presents him with complete schematics and specs for the Odyssey². Helms wants Baer to take the specs back to his employers, Sanders Associates, for comment and "moral support." Eventually, Fort Wayne receives official confirmation that the Odyssey² project will continue. Charles B. (Chuck) Heffron is named Videogame Chief Engineer, and Gene Kale is assigned as the "Intel Game" group leader. Baer later summarizes his trip in a memo where he notes, "Almost sure I saved the program!" Ralph Baer and his sidekick, Lenny Cope, contact Stan Maser at Intel to discuss Odyssey² technical information and request a second breadboard. John Fauth calls Ralph Baer and confirms Magnavox management's decision to continue with the Intel Game design. In a telephone conversation with Frank Quota, Chuck Heffron's boss at Magnavox, Ralph Baer learns that Magnavox management has officially approved the Intel Game and its European PAL equivalent. The approval came out of a meeting between Magnavox VP Chuck Dolk, Senior VP John Fauth, and Magnvaox President Alfred di Scipio. Quota tells Baer that everyone at Magnavox believes they need Sanders to design and critique their games to better compete with Atari. Ralph Baer visits Fort Wayne to meet with Dolk, Quota, and Mike Staup, the Magnavox VP in charge of games. Baer learns that Magnavox wants one or two games from Sanders that make use of Odyssey²'s strengths, especially its keyboard. The games need to be available by Feb. 1, 1978. In addition, Magnavox wants Sanders's input on "good" games to help support its programming staff, which, at the time, consisted of two people: Sam Overton and Bob Harris, with Ed Averett working as an outside consultant. Magnavox President Alfred di Scipio says that his company's failure to produce a programmable video game system for Christmas 1977 is not a disaster because "There is no sound evidence yet that a large unit market is there at the price points these products require." Source: "Video Games Race to Catch a Changing Market." Business Week: Dec. 26, 1977, Page 44 B.
Ralph Baer requests all available information on Odyssey² hardware to assist Sanders in making proposals regarding their level of support for the machine. Sam Overton is assigned as the Sanders coordinator. Overton says that six games are done, but that ten are needed before Christmas. Overton is concerned; he is now the lone Odyssey² programmer at Magnavox. Sanders offers to do programming. In a memo, Baer suggests using player-positioned bumpers in the Programmable Pinball game Sanders is developing for the Odyssey². This would make use of Telesketch -- a technology patented by Sanders in 1976 that allows players to draw graphics on the screen and have the game become "aware" of their positions. This suggestion is adopted. According to its copyright registration, Take the Money and Run is published on this date. In May, Magnavox announced that it anticipated FCC approval of the Odyssey² in July, and planned to announce the system's availability (plus eight cartridges) this month. The expected retail price: $179. Source: "Atari's Game Plan to Overwhelm Its Competitors." Business Week: May 8, 1978. Page 50 F.
Sanders delivers the Programmable Pinball game to Magnavox. The cost of the job: $50,000. The Philips G7000 launches (in Europe) during the Christmas season. Around 7,500 units sell before the launch is cancelled due to a defect in the power plug. The G7000 successfully re-launches in 1979. According to various records filed in the U.S. Patent and Trademark Office, this is the date when Odyssey² trademarks -- including the system's logos -- were first used in commerce. This indicates that Odyssey² was officially released in the United States during this month. The copyright for Take the Money and Run (#TX0000394364) is registered on this date. The registrant is Edward B. Averett. According to copyright registrations, Showdown in 2100 A.D., I've Got Your Number, War of Nerves and Invaders from Hyperspace are published on this date. The First Issue date for Magnavox Service Manual No. 6510, "Odyssey² (BJ/BK7600) Video Game System." According to copyright registrations, Hockey/Soccer and Alpine Skiing are published on this date. The copyrights for Showdown in 2100 A.D. (#TX0000569464), Hockey/Soccer (#TX0000569465), I've Got Your Number (#TX0000569466), War of Nerves (#TX0000569467), Alpine Skiing (#TX0000569468), and Invaders From Hyperspace (#TX0000569469) are registered on this date. The registrant for each game is Edward B. Averett. Ed Averett demonstrates an initial version of K.C. Munchkin (which is not yet known by that name) to Mike Staup. A revised version of K.C. Munchkin is approved by North American Philips. Production of the game begins. General Telephone and Electronics Corporation (GTE) agrees to sell its U.S. consumer electronics business, which includes the Sylvania and Philco television brands, to North American Philips. Hereafter, GTE employees are able to purchase Magnavox and Philips products -- including Odyssey² -- through the employee store at a discounted rate. Source: Arenson, Karen W. "G.T.E. Sets Electronic Units Sale." The New York Times: Oct. 3, 1980. Section D, Page 1. According to its copyright registration, Alien Invaders—Plus is published on this date. McDade's, a Chicago-area retailer, ends a special holiday offer: a new Odyssey² console for the low price of $139.76! Source: The Odyssey² Homepage! - Media! - Videos! According to its copyright registration, UFO is published on this date. The copyrights for UFO (#TX0000788045), Alien Invaders—Plus (#TX0000788046), Blockout/Breakdown (#TX0000788047), Casino Slot Machine (#TX0000788048), Pachinko (#TX0000788049), Pocket Billiards (#TX0000788050), Electronic Table Soccer (#TX0000788051) and Volleyball (#TX0000788052) are registered on this date. The registrant for each game is Edward B. Averett. The registrations also list June 1 as the date of publication for each game (except for Alien Invaders, which has a publication date of Dec. 1, 1980). Magnavox increases its budget by $5 million -- to $9.1 million total -- to support the Odyssey brand. Source: McClenahan, Cheryl. "Magnavox Turmoil Leads to Campbell-Ewald Firing." Adweek: June 4, 1984. An Odyssey² television commercial featuring the voice of Leonard Nimoy hits the airwaves. Quest for the Rings is introduced. North American Philips issues the first of two memos to its sales force, emphasizing that the company does not want "others to misapply our game names and trademarks to their games. Likewise, we should not use other people's trademarks or game names to refer to our own games." These memos would later be cited in a lawsuit filed by Atari, alleging that NAP engaged in copyright infringement and unfair trade practices. According to the K.C. Munchkin trademark record, this is the date that the trademark was first used in commerce. This could be the game's official release date. Minnesota Fats, "The Video King," a retailer in the Chicago area, runs an advertisement in the Chicago Sun-Times that hails K.C. Munchkin as a "Pac-Man-type game." This ad will later be used in the Atari lawsuit to indicate that K.C. infringes on Pac-Man's copyright. A legal secretary named Linda Pierce, who works for Atari's legal firm, is instructed to purchase a copy of K.C. Munchkin. She calls a Chicago store named Wieboldt's and is told by a store representative named Mr. Sarno that the game is "just like Pac-Man," but that the store does not have any copies in stock. An investigator for Atari's legal team named Thomas P. Gallo visits a Minnesota Fats store in Oak Lawn, IL. He purchases one of the three K.C. Munchkin carts the store has in stock, and is told by a female sales clerk that the game is "just like Pac-Man." Atari, Inc. and Midway Mfg. Co. file suit against North American Philips and Park Television, a Magnavox Home Entertainment Center, in the United States District Court for the Northern District of Illinois Eastern Division. The suit alleges that K.C. Munchkin infringes on Pac-Man's copyright, and that the defendants engaged in deceptive trade practices by comparing the two games. Case number 81-C-6434. North American Philips issues a second memo to its sales force that reiterates the policy outlined in the Oct. 27 memo. A decision is reached in the Atari/Philips lawsuit. United States District Judge George N. Leighton finds in Philips's favor, ruling that K.C. Munchkin is not "substantially similar" to Pac-Man because ordinary observers would not confuse the two games. Atari's request for a preliminary injunction is denied. Atari would soon file an appeal. The start date of the first Great Game Giveaway. Orders placed between this date and the end of the Giveaway received a free game cartridge, a free charter membership in the Odyssey² Adventure Club, and a free subscription to Odyssey² Adventure magazine. The end date of the Great Game Giveaway. An appeal of the Atari/Philips lawsuit is argued before the United States Court of Appeals, Seventh Circuit. The appeal is assigned case number 81-2920 and is presided over by Circuit Judges Wood and Eschbach, and District Judge Myron L. Gordon. The five Odyssey² Adventure subscribers who submit the highest scores by this date will win a free Quest for the Rings T-shirt. UK G7000 owner Peter Courtney sends a letter to the UK G7000 Marketing Manager, Steve Newbold, describing his ideas for a new game set in a haunted house. A trademark application is filed for K.C. Munchkin. The Court of Appeals overturns the District Court's earlier ruling and issues a preliminary injunction against North American Philips. K.C. Munchkin is found to be "substantially similar" to Pac-Man and is soon pulled from store shelves. Steve Newbold sends a reply to Peter Courtney, thanking him for his haunted house game idea. Newbold claims to have sent the idea on to the G7000 games designers for consideration. The Wall Street Journal reports that North American Philips has introduced The Great Wall Street Fortune Hunt. Source: Sansweet, Stephen J. The Wall Street Journal: Apr. 20, 1982. Page 18. In a preview of the game, Odyssey² Adventure magazine says to watch for the release of Pick Axe Pete! around this date. At 6:30 p.m. in Chicago, the Second City comedy troupe presents a comedy show entitled The Odyssey & The Ecstasy Or "What's in A Game?" The show is presented for employees of North American Philips. The performance coincides with the Summer CES. The due date for entries to the Pick Axe Pete Pick-Off. According to Odyssey² Adventure magazine, The Voice of Odyssey² is scheduled for delivery this month. The debut of several television commercials featuring the Wizard of Odyssey. This is probably the date that the Fall 1982 issue of Odyssey Adventure went to press. As of this date, one winner has been announced in the Kellogg's Instant Win Odyssey Video Games contest (Fred B. McGillvray of Newville, PA), and one winning game piece is still available in a box of Kellogg's cereal somewhere. North American Philips finally gets around to filing some Odyssey² trademark applications. The first is for the original "vanishing point" Odyssey² logo; the trademark for the original 1972 Odyssey ITL-200 logo is cited as a prior registration. A second application is filed for "Video Output Game Machines and Game Cartridges Therefor." Another is filed for "Electronic Computers/Computer Modules." North American Philips files a trademark application for the later, block-letter style Odyssey² logo. The trademark for the original 1972 Odyssey ITL-200 logo is cited as a prior registration. At a press conference in Tokyo, North American Philips Consumer Electronics Corp. announces that the Odyssey² will soon be "fully marketed" in Japan via two major distributors: Kawada Co. and Tsukuda Co. NAPCEC President Frank Lann talks up the educational potential of the machine, and the company expects to market 100,000 consoles and a half million cartridges in Japan within the first year. Source: "U.S. Odyssey 2 Video Game for Sale." The Japan Economic Journal: Oct. 5, 1982. Page 14. Source: "Corton Trading Will Slash Video Game Machine's Price." The Japan Economic Journal: May 17, 1983. Page 18. The United States Supreme Court declines to hear North American Philips's appeal of the K.C. Munchkin decision. The findings of the Court of Appeals stand unchanged. The first day of The Wizard's Great Game Giveaway. Customers who purchase an Odyssey² console between this date and the end of the Giveaway are eligible for the title of "Honorary Wizard" and are entitled to two free games: one Master Strategy title and either K.C. 's Krazy Chase or Pick Axe Pete. The first day that employees of GTE could participate in The Wizard's Great Game Giveaway. The Giveaway entitles GTE employees to receive two free games when purchasing an Odyssey² console through the GTE Employee Store. Finalists in the Pick Axe Pete Pick-Off begin arriving at the Knoxville Hilton Hotel. Starting at 10:15 a.m., the National Finals of the Pick Axe Pete Pick-Off are held at the World's Fair in Knoxville, Tennessee. Tony Scardigno of Weehawken, NJ, is the winner, with a score of 938. Scheduled release date for P.T. Barnum's Acrobats. Odyssey Good Stuff orders (sent through Odyssey Adventure magazine) received prior to this date are entitled to a Quest for the Rings poster (a $2.95 value!) free of charge. Attack of the Timelord! was scheduled for release early this month. The final date of The Wizard's Great Game Giveaway offer for GTE employees and for the general public. During a Christmas promotion, GTE employees can buy a new Odyssey² console for the special price of $125 (as opposed to the regular employee discount price of $132). The promotion ends on this day. The suggested retail price of an Odyssey² console at this time: $199. The brochure advertising special Christmas Odyssey² deals for GTE employees is to be removed from company bulletin boards on this date. With much fanfare, North American Philips exhibits the Odyssey3 Command Center at the Winter CES in Las Vegas, NV. Mail-in certificates for The Wizard's Great Game Giveaway, which ended in December, would no longer be honored after this date. Demon Attack and Atlantis are originally scheduled for release sometime after January 1983. Odyssey Good Stuff orders postmarked by this date would receive a free Freedom Fighters iron-on transfer. Scheduled release date for Killer Bees. Electronic Fun with Computers & Games reports that the Odyssey3 Command Center will be on the market by July 1983. Scheduled release date for Turtles. The end date of the Kellogg's Instant Win Odyssey Video Games Sweepstakes. Kooton (or "Corton") Trading Corp. lowers the price of Odyssey² consoles in Japan from 49,800 Yen to 29,800 Yen, a 40% drop. Cartridges will sell for 7,900 Yen. Kooton reports shipping about 3,000 Odyssey² units since September 1982. Kooton also plans to start distributing The Voice in Japan during this month. Christer Medin, Software Manager of the Electronic Games division in Eindhoven, Netherlands, sends a letter to Peter Courtney. In the letter, Medin says that the programming and consumer groups are investigating the possibility of producing Courtney's haunted house game for the G7000. A price list dated this date lists "Power Lords I" and "Adventures of the Pink Panther" as "Coming Soon." On the opening day of the Summer CES in Chicago, IL, Philips VP of Marketing Jerry Michaelson announces that the Odyssey3 Command Center has been put on hiatus, saying, "We're putting the system on hold for the time being. Our big news right now is that Odyssey intends to become a major force in video game software." For the rest of the CES, Odyssey heavily promotes its upcoming games for the Atari 2600 and ColecoVision consoles. Source: "Fall Electronics Review." Video Games, October 1983. Page 35. In Chicago, The Second City comedy troupe presents "A Video Game Comedy Caper" for North American Philips employees. Source: The Second City. A Video Game Comedy Caper. NAP Video Network: 1983. The end date for entry into the Second Chance drawing of the Kellogg's Instant Win Video Game Sweepstakes. Philips N.V. (Philips Europe) announces that it will cooperate with Thomson-Brandt S.A. to produce video game consoles and cartridges. This collaboration will eventually lead to the Jopac line. Source: Reuters. "Philips Video Pact." The New York Times: June 22, 1983. Section D, Page 4. The final date of entry for a Crazy Chase contest held in England. Players were to solve three scrambled word puzzles and submit their entries on a postcard. Fifty lucky entrants would win a Crazy Chase cartridge. The due date for entries in the "Win One for the Turtle" Odyssey Home Arcade Center giveaway contest. The winners list for the "Win One for the Turtle" Odyssey Home Arcade Center giveaway contest is to be available after this date. The businesses Rádio Cidade and Laser Jeans, with the support of Philips and the Morumbi Shopping center in São Paulo, Brazil, sponsor an eight-day Odyssey tournament. Divided into age groups, contestants compete for high scores on Come-Come (K.C. 's Krazy Chase). Winners of the Rádio Cidade and Laser Jeans Odyssey tournament are announced. Marcelo Polverini wins the age 10-13 group, Fábio Luiz Garbossa Francisco wins the age 14-17 group, René Rui de Souza wins the 18-21 group, and Márcia F. Pinto is the winner of the group for those over age 22. Nightmare is released in Europe. Scheduled release date for Pink Panther and Power Lords for the Atari 2600, as well as Air Defense for the ColecoVision. None of these games were released. Scheduled release date for Power Lords for the Odyssey², as well as "Cavern" (aka Lord of the Dungeon) for the ColecoVision. Probe 2000 releases its one and only game: War Room for the ColecoVision. Games magazine calls Turtles one of the "Best New Games." Scheduled release date for ColecoVision Flash Point. North American Philips files a request for a patent of the Odyssey3 hand controller. James M. Lentz is listed as the inventor. As is typical with patents, the application is not granted for over a year (see April 1985 entry). North American Philips Consumer Electronics Corp. files a patent application for a "video game device with automatic standby mode." The device is a game console that stops supplying power when cartridges are removed. Diagrams included with the application show the Odyssey² and suggest that it incorporates the standby technology. The inventor is listed as Charles B. Heffron. This application is not granted for another two and a half years (see April 1986 entry). Scheduled release date for the ColecoVision version of Pink Panther. Orders received in response to the Odyssey² Video Game Christmas Gift Guide by this date would receive free gifts and be eligible to win a free trip to Disneyland. Electronic Fun with Computers & Games reports that all remaining Probe 2000 games have been "permanently cancelled." The Wall Street Journal reports that Philips Europe and Atari are in negotiations to produce a new kind of video game system. Nothing was to come of this collaboration, however. Prices in the Christmas Gift Guide were good only through this date. NAP announces that Odyssey production has recently ceased. NAP spokesman Pat Wilson says that the Odyssey division will be dissolved within a year because of "general market conditions." Odyssey orders will be filled until supplies run out, which is expected to be in early 1985. In the meantime, most of the Odyssey division's approximately 40 employees will be reassigned to another division. Wilson goes on to say that Odyssey "was never a major factor" in the home video games market. Source: Eblen, Tom. "Pioneer Home Video Game Is Dropped." The Associated Press: Mar. 20, 1984. With ironic timing, since the Odyssey brand had been retired mere months before, the U.S. Patent and Trademark Office finally gets around to issuing Odyssey² trademarks. The original "vanishing point" Odyssey² logo (serial number 73388304) is granted registration number 1330713. A second trademark is registered for the later, block-letter style logo: serial number 73389949, registration number 1300714. Another trademark is issued for "Video Output Game Machines and Game Cartridges Therefor," serial number 73388293, registration number 1330712. Steve Newbold replies by letter to Peter Courtney, stating that Courtney's idea "did not prompt the original design" of Nightmare and that the many similarities were simply "a case of 'great minds think alike.'" Issue 11 of the Brazilian videogame magazine Micro & Video previews A Turma da Mônica, a game based on and named after the famous South American comic strip. The game is never released. North American Philips is granted U.S. Patent #4,514,600 for a "video game hand controller." The design covered by this patent was slated for use on the now-defunct Odyssey3 Command Center. North American Philips Consumer Electronics Corp. is granted U.S. Patent #4,579,338 for a "video game device with automatic standby mode." The design covered by the patent was used in the Odyssey² console. And now that even the paperwork is done, the Odyssey² era is truly over. John Dondzila announces the first release of his Odyssey² Multicart, which contains 56 games. The original cost: $75. The Odyssey² Homepage! goes online. Dan Boris releases the first version of O2EM, the first Odyssey² emulator. John Dondzila announces the release of Amok!, the first new Odyssey² game in 15 years. The programmer known only as "VPaC" releases J.G. Munchkin, the first widely-distributed ROM hack of an Odyssey² game (Attack of the Timelord). Source: "Updates 9/1/1998." The Odyssey² Homepage News Archive: 1998. Troy Lukkarila contacts William Cassidy about Probe 2000 prototype games he owns: ColecoVision Lord of the Dungeon, ColecoVision Power Lords, and Odyssey3 Flashpoint -- games that are eventually reproduced and distributed to collectors. Thirty Pinball! cartridges, autographed by Ralph Baer, are released at Classic Gaming Expo 2000; Sanders's Programmable Pinball game from 1978 finally sees the light of day. Reproductions of ColecoVision Power Lords and Lord of the Dungeon also debut this day. Nico Sapin announces the release of the first Videopac prototype reproduction cartridge: Interpol, which he assigns #61. The deadline to enter Nico Sapin's contest to win a free copy of Clay Pigeon +. Mark Guttenbrunner is the winner. Sales of this reproduction cartridge also begin on this date. ClickGamer.net releases Pocket Odyssey², a PocketPC Odyssey² emulator. 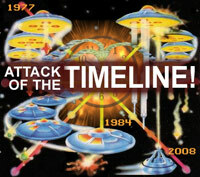 Sören Gust releases the final version of the Kill the Attacking Aliens ROM. Packrat Video Games releases Planet Lander!. People who ordered Planet Lander! by this date could buy the game at an introductory price of $18.95. Regular retail price: $19.95. Classic Consoles Center releases a G7400-compatible version of Odyssey3 Flash Point on cartridge. Humanoid Games releases the prototype reproduction cartridge Mission Impossible / Programmed Trip. Mr. Roboto receives its first public demonstration at Classic Gaming Expo 2005, at the Packrat Video Games booth. Mr. Roboto is released at a meeting of the Northwest Classic Gaming Enthusiasts in Seattle, WA. Dieter König releases the prototype reproduction cartridge Shark Hunter. Bas Kornalijnslijper releases the prototype reproduction cartridge Spider-Man at the Retro Computer Meeting in Scheidam, Netherlands. Calculator! is released at the Midwest Gaming Classic in Milwaukee, WI. Packrat Video Games releases Puzzle Piece Panic!. Dieter König releases the prototype reproduction cartridge Tutankham. Revival Studios releases Munchkin+, a "Plus" graphics enhanced version of Videopac 38: Munchkin. Bas Kornalijnslijper releases the prototype reproduction cartridge MelRep. Source: Bas Kornalijnslijper's Videopac Page. Dieter König releases the prototype reproduction cartridge Martian Threat. This Timeline is first published. Bas Kornalijnslijper releases the prototype reproduction cartridge Play Tag at the Retro Spelcomputer Beurs in Apeldoorn, Netherlands. Route 66+, a "Plus"-enhanced version of the homebrew racing game Route 66, is released at Eurocon/Retrobörse in Vienna, Austria. Source: König, Dieter. "Route 66 Introduction." Classic Consoles Center: November 2009. Route 66+ becomes available through mail order. Bas Kornalijnslijper releases the reproduction run of the Videopac Service Test Cartridge at Retro Spelcomputer Beurs in Apeldoorn, Netherlands. Classic Consoles Center debuts the cartridge version of Baseball+, a G7400-compatible version of Odyssey3 Baseball, at the second Retrobörse in Vienna, Austria. Source: König, Dieter. "Baseball+ Introduction." Classic Consoles Center: December 2010. Revival Studios releases Astro Dodge, its first original homebrew game for Videopac and Odyssey² consoles. Revival Studios releases Mayhem, another original Videopac/Odyssey² homebrew title, at the Retrobörse in Bochum, Germany. Like Astro Dodge, Mayhem features enhanced graphics when played on G7400-compatible machines. Revival Studios releases ColorClash, a Videopac/Odyssey² homebrew title based on one of Revival's original Vectrex games, at the Retrofair in Apeldoorn, Netherlands. Like Revival's other homebrews, ColorClash features enhanced graphics when played on G7400-compatible machines. Thirty copies of Chris Read's Fatso – an Odyssey² homebrew version of the Atari 2600 game Fast Food – are released.